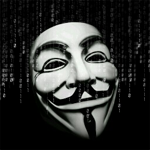 A Practical Attack to De-Anonymize Social Network Users shares a lot of valuable information. The paper describes a combination of History Stealing and fingerprinting (based on group memberships) that was used to identify a user’s Xing profile. Particularly interesting are the techniques to extract profile information from social networks (that are still working). Since 2010 it is „unfortunately“ no longer possible to use the mentioned exploit to optain the browsing history (see Preventing attacks on a user’s history through CSS :visited selectors) – at least as long as you don’t get the user to actively interact with your page. In that case History theft with CSS Boolean algebra might be possible (though it certainly won’t scale well enough for a real threat). A user clicks on a transparent like button for a fanpage and triggers a script that immediately gets the newest ‚fan‘ of that page. Try to load (company internal) intranet URLs to check if they resolve or deliver an error. Simluation of keyboard events to read information from auto-complete fields. My approach makes use of the brower’s behaviour when it has to load a URL that ist blocked by a CSP restriction. CSP is the appreviation for Content Security Policy and is used to provide a whitelist of trustworthy sources for external resources like images, JS- and CSS files, etc. in order to deny the loading of malicious code. See An Introduction to Content Security Policy for a great introduction into the matter. How does it look in the code? So far so good – but CSP also reveals whether a certain URL can be successfully requested – which becomes especially interesting when that URL gives us some clues about the users identity. 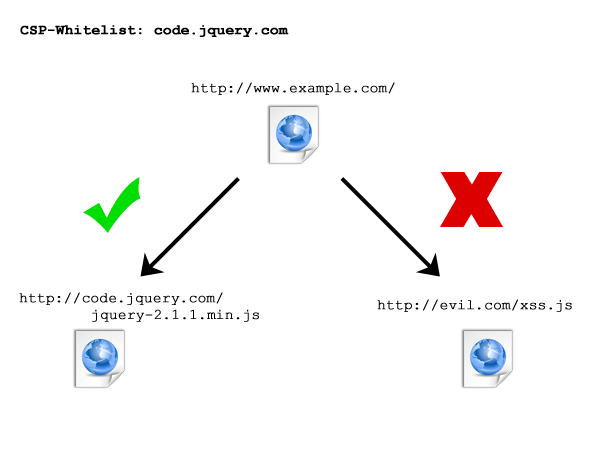 Let’s assume we find a URL („Original-URL“) that perfoms a redirect based on private information (e.g. login status), then we could verify the target url („Target-URL“) of said redirect. We just need to allow to load resources from Original-URL as well as Target-URL by setting an appropriate CSP header. 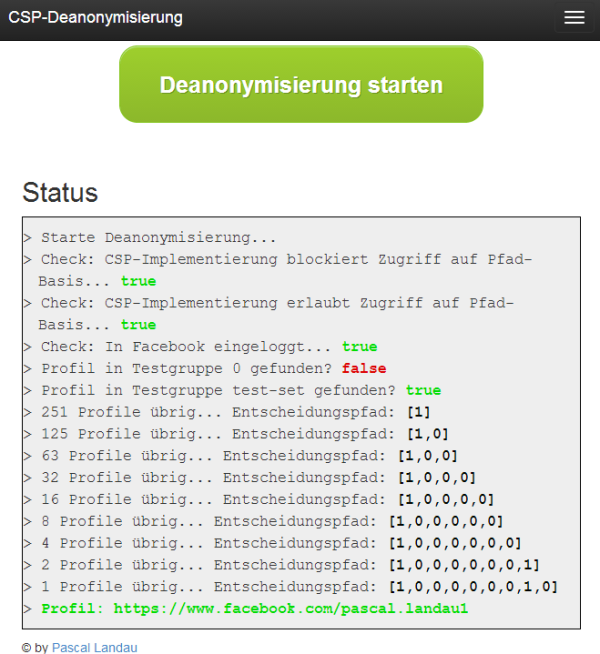 If I’m logged into Facebook as Pascal Landau, https://www.facebook.com/me will redirect to https://www.facebook.com/pascal.landau1 and the browser would report a failed request. If I’m not logged into Facebook, https://www.facebook.com/me will redirect to https://www.facebook.com/login.php?… and the browser would report a successful request. a) If I'm logged in, this request will _fail_. _not_ on the CSP whitelist. b) If I'm _not_ logged in, this request will be successful. By now I know at least if I’m logged into Facebook (a) or not (b). What I do not know is my profile URL (I’m only able to tell if the request for https://www.facebook.com/login.php was successful). 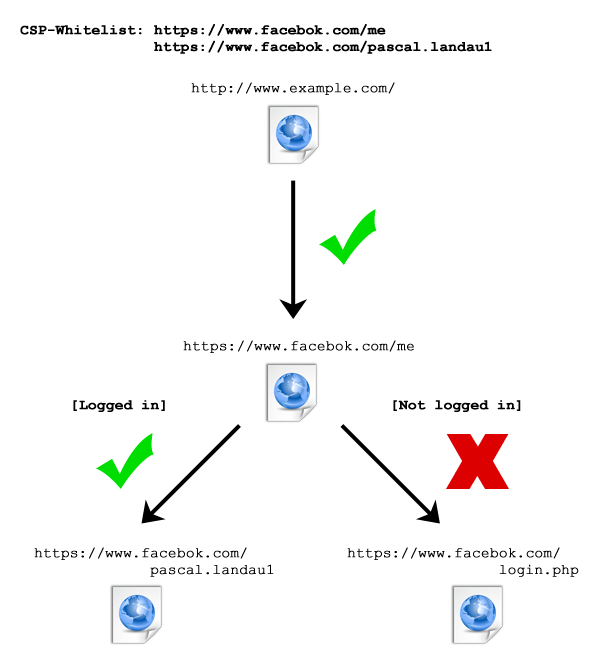 If I’m logged into Facebook as Pascal Landau, https://www.facebook.com/me will redirect to https://www.facebook.com/pascal.landau1 and the browser would report a successful request. 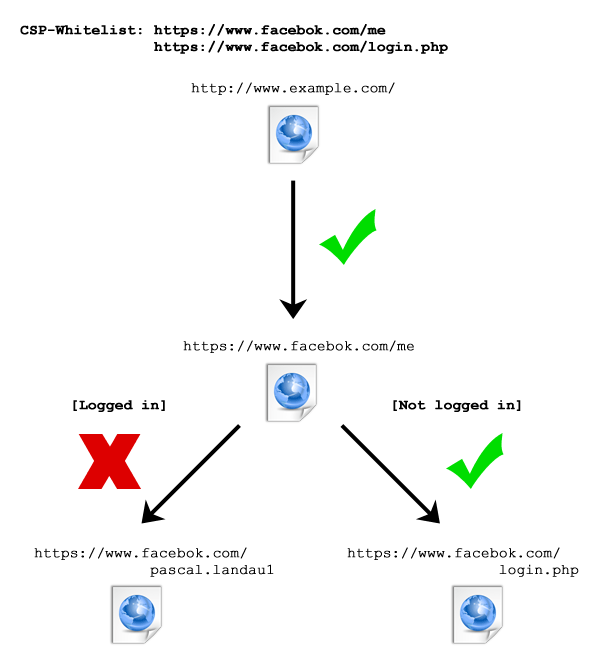 If I’m logged into Facebook as someone else, https://www.facebook.com/me will redirect to https://www.facebook.com/pascal.landau1 and the browser would report a failed request. If I’m not logged into Facebook, https://www.facebook.com/me will redirect to https://www.facebook.com/login.php?… and the browser would report a failed request. a) If I'm logged in _as Pascal Landau_, this request will be successful. b) If I'm logged in _as someone else_, this request will fail. c) If I'm _not_ logged in, this request will fail. https://www.facebook.com/me redirects to https://www.facebook.com/pascal.landau1 and the browser reports a successful request. https://www.facebook.com/me redirects to https://www.facebook.com/pascal.landau1, which is no longer present in the CSP header. Consequence: The browser reports a failed request. That looks much better: We can easily check 1 billion URLs in about 30 HTTP requests! Unfortunately, this approach still has a drawback :/ Profile URLs can only be checked in the browser of the client, so we need to transfer them to him.Let’s assume we wanted to check 1 billion profile URLs for a random User. For the sake of simplicity, every URL consists of 35 characters and looks like https://www.facebook.com/0000000001, https://www.facebook.com/0000000002, etc. Each character takes up 1 Byte of memory so we end up with 1 x 35 x 1.000.000.000 Byte = ~32,6 GB! Even when we strip everything but the path (e.g. 0000000001 instead of https://www.facebook.com/0000000001) we’re still left with 1 x 10 x 1.000.000.000 Byte = ~9,3 GB. That’s a freaking lot of data to transmit! The compression factor seems to be around 5:1 – but we used rather compression friendly data (only 10 different characters), expect this to be much worse in reality. Even in this very optimistic scenario we’re at a huge 2 MB of data for one request containing 1 million profiles. Inevitably, that leads to long transmission times and very much traffic. We’re really hitting a wall here! In my opinion, the only viable approach is a prequalification of profiles that need to be checked so that we keep the total number low. First of all, every information we obtain about the user upon his first request should be evaluated as a possible means of prequalification. There are two things that immediately come to mind: IP address and browser language. 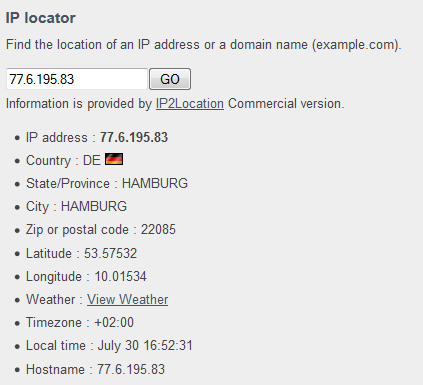 The IP address can be used to identify the location of our user (using the [public and free] API of IPInfoDB, for instance) and try to match that to the hometown of a facebook user (see next chapter for a way to get the hometown). If the browser includes an Accept-Language HTTP header in its request, we might use that to match the locale-setting of a profile (again, see next chapter). The paper A Practical Attack to De-Anonymize Social Network Users mentioned in Related Work also provides an interesting approach to prequalify a set of users: The browsing history is checked for visited (Xing-)groups so that the set of possible profiles is restricted to the members of those groups. The problem of checking all profiles is thereby effectively reduced to the checking of all groups – which is a much lower number. This technique can be further improved (avoid really large groups, identify overlapping members and remove redundant groups, etc.) and possibly also used on Facebook. Again, history stealing does no longer work in modern browsers (so we cannot just copy that approach) and couldn’t find a CSP based vulnerability (yet). Let’s assume you’re already interested in a certain group of people who you identified on Facebook and whose profile URLs you extracted (I’m pretty sure the NSA has such a list.. ;)). Using my approach it is possible to identify a user of that set if he visits an „infected“ page. Once indentified and properly tracked he can easily be recognized on every page that you control. What’s that? That’s not a real world scenario because he won’t ever visit an „infected“ page in the first place? Well why don’t you just target him with Facebook Ads based on his Facebook User ID? That leaves us with two possible options: Using the Facebook Graph-API and screen-scraping Facebook’s webpage. One word of warning: Scraping on a large scale is legally not permitted! Have a look at the User table. We can access a subset of those information via http://graph.facebook.com/[User ID] (facebook uid) or http://graph.facebook.com/[Username]. Note: The „locale“- field allows us to perform the aforementioned matching on browser language. But it get’s better: By using FQL queries it’s possible to perform bulk-request – just use an IN statement with a list of user IDs or usernames. The maximum number of returned profiles seems to be 5000 per request. 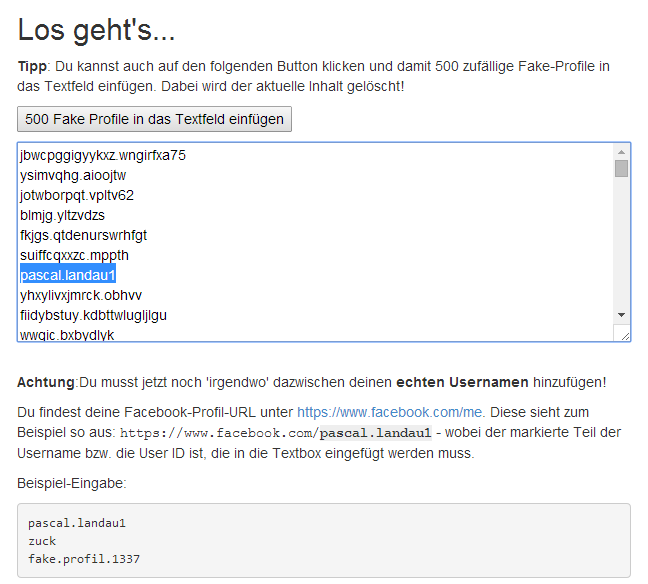 In theory , „only“ about 1.000.000.000/5000 = 200.000 requests are required to get all of Facebooks profile urls. Still a lot but certainly doable and much better than 1 billion requests. We assigned numerical blocks in the early days, but today user IDs are not issued sequentially. We draw them from a variety of number ranges. … Facebook provides us with a nice list of all publicly available profiles in its people directory! Now we just need to drill down to the lowest level (e.g. https://www.facebook.com/directory/people/A-1-120) and scrape all profile URLs. We could even use those to fire bulk requests against the API in order to enrich the data. The deanonymization technique presented above will only work when the browser matches the whitelist of sources in the CSP header on a path level. That does not comply with the first CSP specification of the W3C, that according to 3.2.2 Source List only requires a validation on host level. That’d make it impossible to check for a full Facebook profile URL – so we cannot check for https://www.facebook.com/pascal.landau1 but only https://www.facebook.com/. Of course that is not sufficient for a deanonymization. Luckily, CSP 1.1 (still a draft) introduces the validation on path level. Abusing this feature for privacy breaches was already discovered in January 2014 by Egor Homakov, who blogged about it in Using Content-Security-Policy for Evil. That started a discussion around a possible threat, resulting in a (provisional) special treatment in the current working draft of the CSP 1.1 specification (see 4.2.2.3 Paths and Redirects). This adjustment restricts the validation after a redirect occured to the host level, effectively removing the possibility to recognize full Facebook profile URLs. Wait.. so all that stuff doesn’t actually work? Nope, I did not say that 😉 The current CSP 1.1 spec exists since 2. Juli 2014 – the previous version of the CSP 1.1 draft does not include the „Paths and Redirects“ part – so the exploit is possible. Said previous version is currently implemented in Google Chrome (tested in Chrome 36) – there is even a bug report from October 2013 explaining exactly the approach I’m taking. Browser implementing CSP 1.0 are not vulnerable to this deanonymization technique. Neither are those implementing the current draft of CSP 1.1. I checked Internet Explorer 11 (seemed to ignore CSP completely…), Firefox (FF30.0, implements CSP 1.0) and Google Chrome (36, is vulnerable – probaly since about version 25). The Can I use… overview for the Content-Security-Policy does not include the implemented CSP version and cannot be used to verify exploitability. Will it work in the future? Well, probably not. Currently only Chrome is vulnerable and there is already an acknowledged bug report. Any other browser should implement the most current version of CSP 1.1 and won’t be vulnerable. Third-Party-Cookies have to be allowed – otherwise it’s not possible to check for a Facebook login. But if that’s deactivated, (legitimate) like buttons for webpages wouldn’t work either. Seems like a rather small use case, why did you put in all that effort? The method employed here is only working in Google Chrome because Chrome implements an old version of the CSP 1.1 Spec. Further it is only practically relevant if a subset of all Facbook profile URLs can be predefined – otherwise the data size ist too large and the attack takes too long to execute. In a test of 100.000 profiles it took about 25 seconds and 2 MB of traffic to successfully deanonymize myself. Although it should be possible to trade time for traffic to some degree if multiple requests are performed in parallel. The theory behind this attack has been explained in great detail – now it’s time to it get to work. I developed a small web application that serves as a Proof of Concept for Deanonymization. The second part continues with an explanation of the functionality. I’d like to extend that explanation a little further. First of all, I did not scrape & use real Facebook user profiles out of fear of legal consequences. So you cannot just „hit a button“ and deanonymize yourself. To be still be able to prove my method, I’ll instead provide a text field, in that the correct profile has to be entered. Feel free to add some other profiles too, since we’re essentially building our own predefined set of Facebook profiles to check. Feel free to propose a better solution! See if CSP is implemented and if it’s CSP 1.0 (host level) or CSP 1.1 (path level). That’s basically the implementation of checking the login-status. We’re using the input of the text field to check for the correct profile URL. In the last step the identified profile is shown to the user. Once again the link to the tool. b) a URL that redirects to that profile url via Location header. I couldn’t find those for LinkedIn (profile URLs are identified by parameters instead of path) or Twitter (no redirect to profile URL found). As a network, there’s little that can be done to prevent this attack. As long as there’s as URL that redirects to the profile of a logged in user, that user can be deanonymized by CSP bruteforcing. What’s left after 4500 words, several hundred lines of code and many hours of try & error?